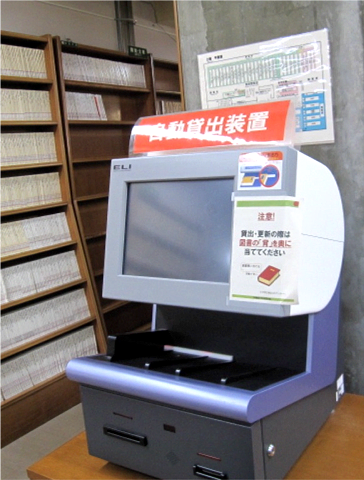 We have a self-issue machine called " Automatic Book Circulation System(ABC-II )"located opposite the main counter on the 2nd floor, that will allow you to borrow/ renew books without having to queue at the counter. Take your items and I.D or library card to a self issue machine and follow the instructions on the screen. At the time of returning, please bring them to the counter. Please be sure to take a receipt with you and confirm the loan period on it. If you have any question, please refer to the attached manual or ask at the counter. ABC provides standard loans ONLY; special loans (e.g. loans for laboratory by professors) should be requested at the main counter. Do not attempt to issue multiple books at the same time. Some books may not be issued to you by ABC because of its irregular size or supplements. When the screen gives you an indication of 'read error' or if you wish to borrow books with no barcode labels, please take them to the counter. no space available on your record.